This is the prediction by eMarketer in their “Global Media Intelligence Report 2014” release date Sep 2014. From the report, eMarketer estimates that by 2018, the APAC digital ad spend will be about $64.37B and out of that $30.5B will be on Mobile (or 47%). 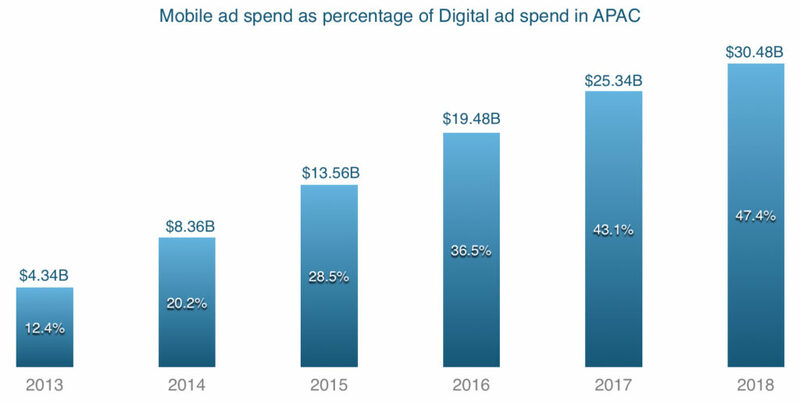 The next logical question you may ask is that unlike North America where there are two main countries (US and CA) that contribute 90%+ of the digital/mobile ad spend, the situation in APAC is much more fragmented. But to what degree? 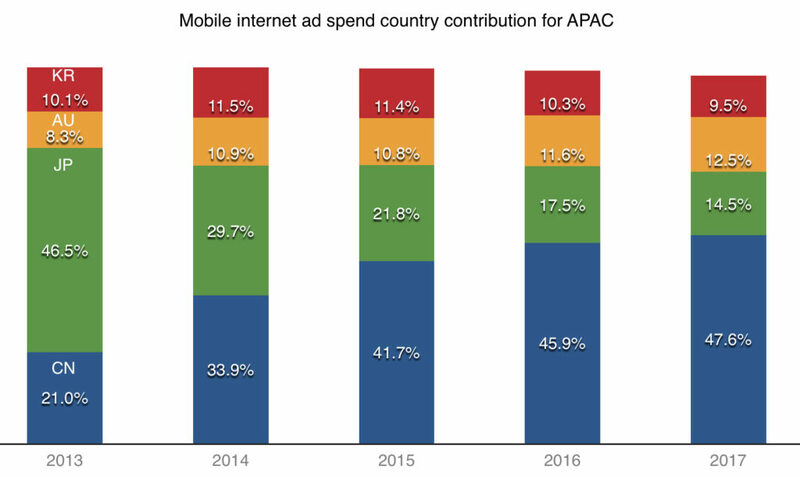 How many countries do we have to cover to hit at least 80% – 85% of all digital ad spend in APAC? China is no doubt the biggest market contributing 44% of digital ad spend in APAC, followed by Japan, Australia and South Korea. 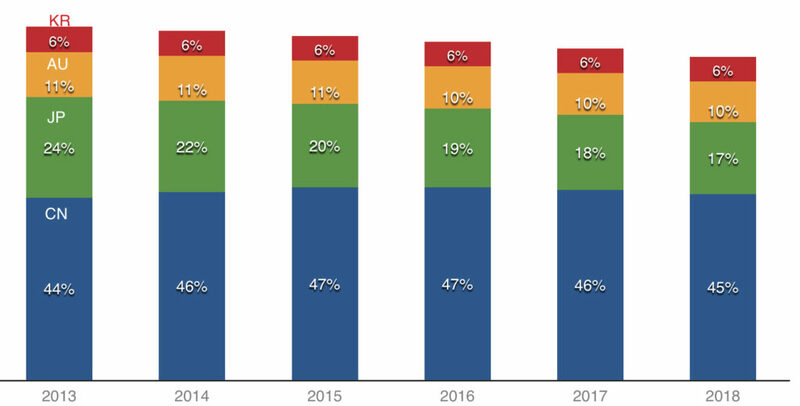 eMarketer estimates that these four countries still commands more than 80% of all digital ad spend in APAC in 2018 albeit increasing importance of other markets. This presents great challenges for digital agencies, technologies providers and other players in the digital ecosystem in APAC because not only we need to cover more markets in APAC compared to North America with lesser spend, these top 4 markets are vastly different from each other. 68% of internet users in China are below 35 year old and 42% of them earning less than US $500/month. On the other end, we have JP and AU being the more mature, highly developed markets. About 50% of Australia mobile internet users are more than 35 years old. As for income, about 41% of Australia mobile internet users earn more than US$50k per year. Similar with the overall digital ad spend, China, Japan, Australia and South Korea are the top 4 markets when it comes to mobile internet ad spend. By 2017, eMarketer forecasts that China mobile ad spend would be more ad spend from Japan, Australia and South Korea combined. So in short, if you work in digital marketing or mobile marketing, China, Japan, Australia and South Korea are the four countries that you can’t ignore. However because they are so different you may need to have different working models for each of the markets. They speak different languages all together as well and each market has very strong culture so having a single central team in any of the market to cover all 4 of them doesn’t seem like a good approach. That’s it for today from me.